I gleefully skipped to French Pink last Saturday with MAC's Hyper in tow; I wasn't sure if my request to use my own polish would be denied. Afterall, French Pink has turned me into a Butter London and Essie junkie and I would never want to offend all of the colours I've loved before. As luck would have it, they gladly obliged and even oohed and aahed upon catching a glimpse of what I got to enjoy all week. 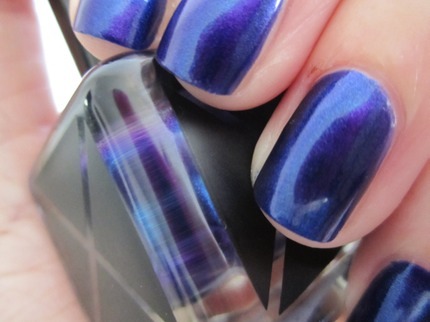 Hyper's formula is thick - you really only need two coats in order to reach the ultimate colour payoff. One coat leaned purple, but two coats added depth and hints of green flecks much like what you would find in a peacock feather. Peacocky I am not, but jazz hands were definitely sparked to life just by wearing hyper. Wear time has been optimal and I only experienced chipping in one spot from clawing at my tights as I rushed to get ready for work one morning.